Milk chocolate bar in shape of a hashtag! They are 200g, no idea how they taste. They taste great bought the last 4 in my local Aldi today. Not surprised this sad bit of crap didn't sell... 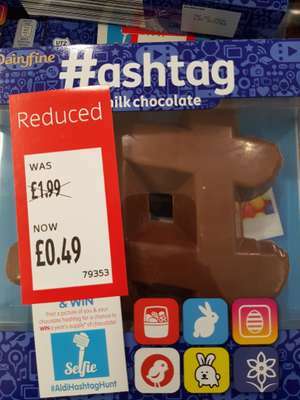 If someone bought me a 'hashtag' easter egg... I'd have to point out that it's not a hashtag, its a hash symbol. This sounds like a national deal, 200g for only 50p is a steal, has anyone else been to there local Aldi and seen them or didn’t stock them? I rather that the square in the middle was filled in with chocolate. I love a chocolate slab! Do you really think it's "#ASHTAG" Aldi?? This sounds like a national deal, 200g for only 50p is a steal, has anyone …This sounds like a national deal, 200g for only 50p is a steal, has anyone else been to there local Aldi and seen them or didn’t stock them?